Jesse Ventura signs 63 Documents the Government Doesn’t Want You to Read. 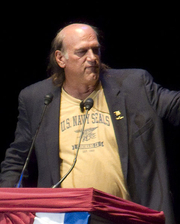 JESSE VENTURA: DON'T START THE REVOLUTION WITHOUT ME! Jesse Ventura , Don't Start the Revolution Without Me!. Jesse Ventura is currently considered a "single author." If one or more works are by a distinct, homonymous authors, go ahead and split the author. Jesse Ventura is composed of 2 names. You can examine and separate out names.